This week a beloved Aunt left this world. She had recently celebrated her 80th birthday and had become a great grandmother. She will be missed. In her memory and as we turn into 2014, I wish each of you the blessings of a new year, new starts, and new opportunities. What a nice tribute to Mary Ann. She was indeed one of a kind. Indeed she was. A force to be reckoned with, remind you of anyone? Thx Suzie – my Aunt was a great example of fun, crazy Irish. 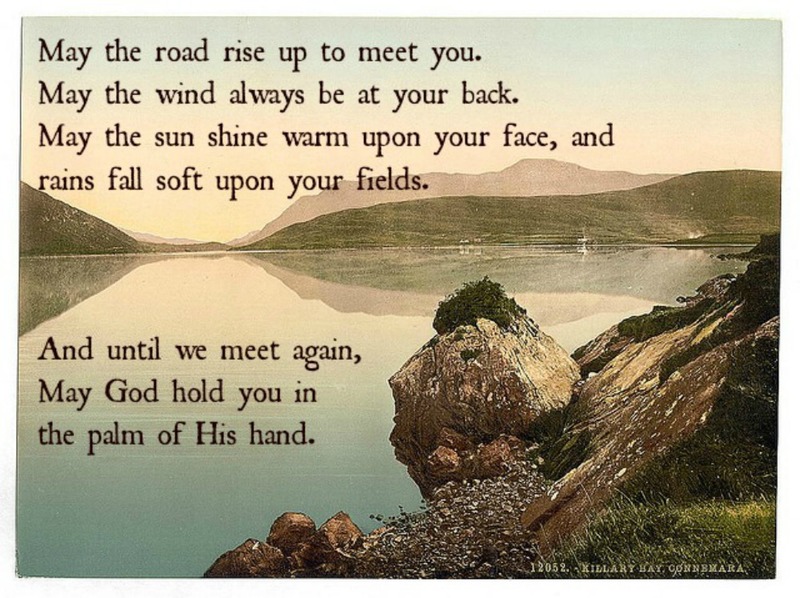 Thanks Tori, this blessing was read at her funeral. Always loved that poem! Blessings to you. Sorry for your loss. How beautiful that you would pair your loss with this gracious prayer. Thank you. My heart goes out to you and your family. Thanks Susan. We honored her on Saturday and blessed her on her journey. My heart is with you and your whole family now that your beloved Aunt has passed on. Thank you for sharing this blessing, Kimba. One I first heard when a near centennial passed on. A very special, and Irish man I remember fondly. Thank you for stopping by Nell, and many blessing to you too. This is one of my favorite sayings/blessings … positive; expectations of celebration; gratitude for all good connections. Most importantly your dear aunt was surronded by love. My Aunt was indeed truly loved – thank you for your comment Kathy. .
What a beautiful sentiment to start the new year! Many blessing to you! Thx Cathy, wishing youa wonderful 2014. OH! I have always loved this blessing. Thank you for sharing it and reminding me. The Irish love their poetry. I have many favorites, but this one always sticks with me. I have always loved that poem, too. My sympathies to you on your loss. I always loved this poem/prayer. Thanks for sharing! New year's blessings to you Lisa. Keep I wrote the same prayer last night. Funny how we are connected. My mom loved you and I’m so glad you were able to see her one last time before she passed. I truly believe God had his hand in this. Love you cuz. My heart is with you Cuz. Love. Sending you light and warmth and peace. Thanks Lori – love and blessings to you too chica.